The Vidalia Onion Committee is partnering with "Shrek: Forever After" to get kids eating produce. 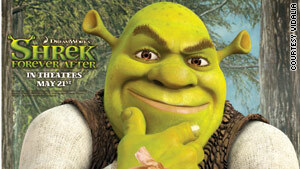 (CNN) -- Next month, the Vidalia Onion Committee, a Georgia group that promotes the consumption of sweet onions, will roll out 6-foot cardboard cutouts of the ogre Shrek as a tie-in to the latest film in the series, "Shrek Forever After." In turn, the Georgia-based growers group hopes the green guy will turn children on to eating Vidalia onions. "We do like to market to younger audiences and teach them about our product," said Wendy Brannen, the committee's executive director. Although it's not the first time movie advertising has taken to the produce aisle (Disney promoted the DVD release of Peter Pan a few years ago with stickers on fresh tomatoes), it's definitely one of the most prominent displays. It's become almost commonplace to see the latest cartoon character pop up on a cereal box or a Happy Meal, but these characters have been creeping up among fresh fruit and vegetable displays in recent years, which industry officials say is all good if it gets children to eat more produce. In a study published last year by the Journal of the American Dietetic Association, researchers at Ohio State University found that adolescents don't meet guidelines for fruit and vegetable consumption, and fruit and juice consumption drops once children turn 6. Popeye and the characters from Disney and Peanuts are among the cartoons that have been featured by produce companies, says Patrick Delaney, communications manager for the United Fresh Produce Association in Washington. And last summer, Sesame Street's Cookie Monster teamed up with Agriculture Secretary Tom Vilsack to promote children eating a rainbow of fresh produce. Shrek seemed an obvious choice for the Vidalia campaign, Brannen says, because the ogre compares himself to an onion in the first Shrek film. "Ogres are like onions," Shrek tells Donkey: "Onions have layers. Ogres have layers. Onions have layers. You get it? We both have layers." Beginning in late April when Vidalia onions are harvested and up through the movie's May 21 premiere, Shrek cutouts will decorate produce aisles in thousands of stores, Brannen says. Along with taking home kid-friendly recipes, shoppers can enter to win a 50-inch television, a Nintendo Wii game system and a Shrek video game. Imagination Farms tapped Disney's wubbable Donald Duck to tout the wonders of cauliflower to the young generation under its Disney Garden line. Donald's got a big bowl of cauliflower florets that he looks very excited to quack down. Hinkle Produce uses Charlie Brown's beagle to sell young shoppers on the merits of its juicy watermelons. Though there's no special Snoopy plastic wrap, the watermelons come in Snoopy-covered watermelon bins. Not content to scarf down cookies, Sesame Street's crumby blue monster joined Agriculture Secretary Tom Vilsack and an animated stalk of broccoli for a public service announcement geared to PBS's youngest viewers on the benefits of eating a wide variety of veggies. Well, if you're waiting for the great pumpkin, look no further than Charlie Brown in the produce aisle. Hinkle Produce of Cissna Park, Illinois, puts its pumpkin haul in big orange bins with Charlie, Snoopy and Linus proclaiming, "It's the Great Pumpkin!" It could be argued that Popeye has been selling kids on spinach since his inception in 1929. California producer River Ranch Fresh Foods has been using Popeye to tout its array of fresh packaged spinach and salad blends under the Popeye Fresh! label since the mid-2000s.